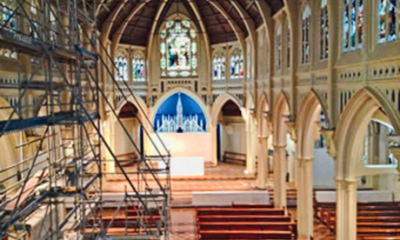 Strengthening St Mary of the Angels church in central Wellington, New Zealand is going to cost about $9.35 million. The parish priest of St Mary of the Angels, Fr Barry Scannell said that at present it met between 15 and 20 per cent of the new building standard and would need significant work on its foundations and structure to bring it as close to 100 per cent as possible. Engineers, architects and geotechnical consultants had spent months preparing plans for the project, which was expected to take 18 months to complete. Scannell said money needed to be raised before work could start. He expected the strengthening would have to be done in two stages. The church would need help from wherever it could get it because the archdiocese, which had responsibility for many other churches, was not able to help. St Marys also had a small pool of parishioners – before the quake an average of 650 people attended mass each week.